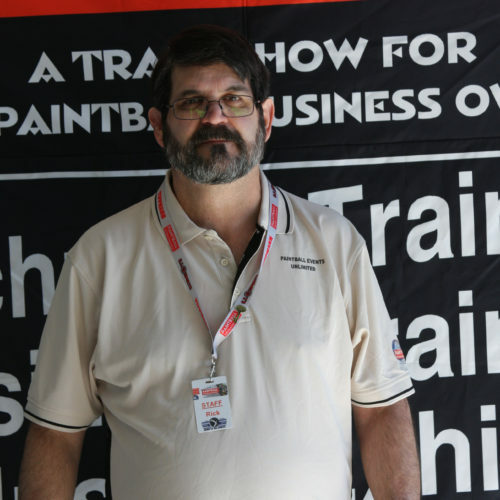 Rick started into the industry in 1995 vending t-shirts at many regional tournaments throughout the Mid West and eventually expanding into product sales representing Ratco, AKA, Ben Tippmann, Hammer Head, Mantis and Ricochet among others. After purchasing a sporting goods store and opening an indoor paintball facility Rick discovered there was not an outlet to learn about the industry and after over a year of planning, in 2005 the first Paintball Extravaganza was held in Springfield, Illinois. The event moved the next year to Atlanta and then on to Washington DC area where it currently remains. Paintball Extravaganza has remained one of the few events the industry has seen independent of any manufacturer ownership. which was one of Rick’s visions from the onset of the event. It has remained the only industry wholesale tradeshow and become the largest dealer summit. It has also become the industry’s largest offering of technical and business training.